Pinatubo Spa Town is among the best places to get a shiatsu massage. I've been there twice and both shiatsu sessions were unbelievably great, especially after a tiring trek to Mount Pinatubo, or in our case, a medical and dental mission in Barangay Sta. Juliana, Capas, Tarlac. The complete spa treatment has three components. 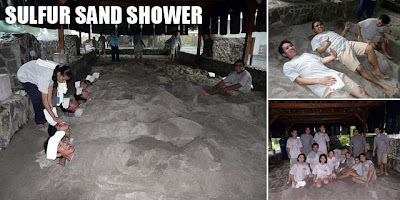 The first is the sulfur sand shower where you are buried up to the neck under volcanic sand from Mt. Pinatubo for 30 minutes. They say it's good for the skin, opens up the pores, and you release toxins while you sweat. But isn't sweat the same with or without being buried under the sand? 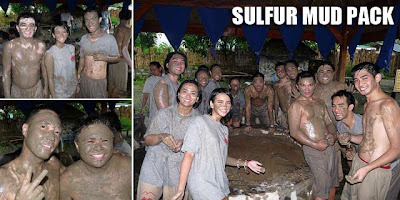 After taking a cold shower, the next component is the sulfur mud pack. It's actually a funny feeling since you basically cover yourself with volcanic mud and wait for it to dry up, again to open the pores. Finally, after rinsing off and one last shower, the last component, and the best if I may say so, is a shiatsu massage treatment in an open air pavilion in the compound. Each component is individually priced at PHP500. But you can get all three at PHP1000, which is quite good a bargain. The lunch is also good and filling. But it's PHP350 per head. 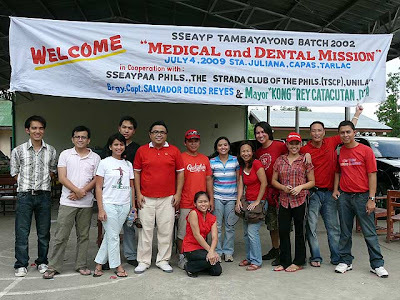 Anyway, Tambayayong 2002, my Ship for Southeast Asian Youth Program (SSEAYP) batch, organized a medical and dental mission last July 4 in Capas. We realized after looking at the registration that we serviced over 500 patients! Thank you to Mayor Rey Catacutan of Capas, Tarlac for being such a gracious host and for taking us around. We got to visit the New Asia Golf Course and the Capas National Shrine after closing hours! Thank you so much to all those who attended and contributed, especially those who donated funds and medicines (we got so much and have supply for our next one in Novenber). I specifically want to thank Unilab whom I personally begged at the last minute. They gave us tons of Diatabs, Biogesic, Medicol and Hydrite. Thank you to the doctors and interns who attended: Joseph Lachica, Ryan Guinaran, Tina Langit (all three were chairpersons of the UP Med Student Council at one time), Gideon Lasco and Ria Santos. Thank you as well to the Strada Club of the Philippines for the dentists. I hope I didn't miss anyone! Napaka relaxing nyan bro and fun experience. Magaling din ang nakaisip ng concept na yan. nagamit ang sulfur sand. question, are the clothes you're wearing during the treatments owned by pinatubo spa town? hi...were intrested po sa spa nyo...pano po ba makakapunta daw? if were from dau mabalacat...? We lived in Japan for years and one of our favorite weekend destinations is a trip to natural spa or hot springs. We now live in the US. 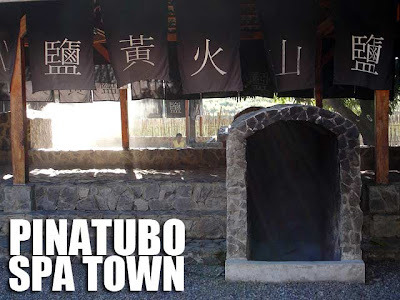 This Pinatubo Spa Town reminds us of our Japan awesome experience. We'll definitely check this place out when we come visit the Philippines this August.